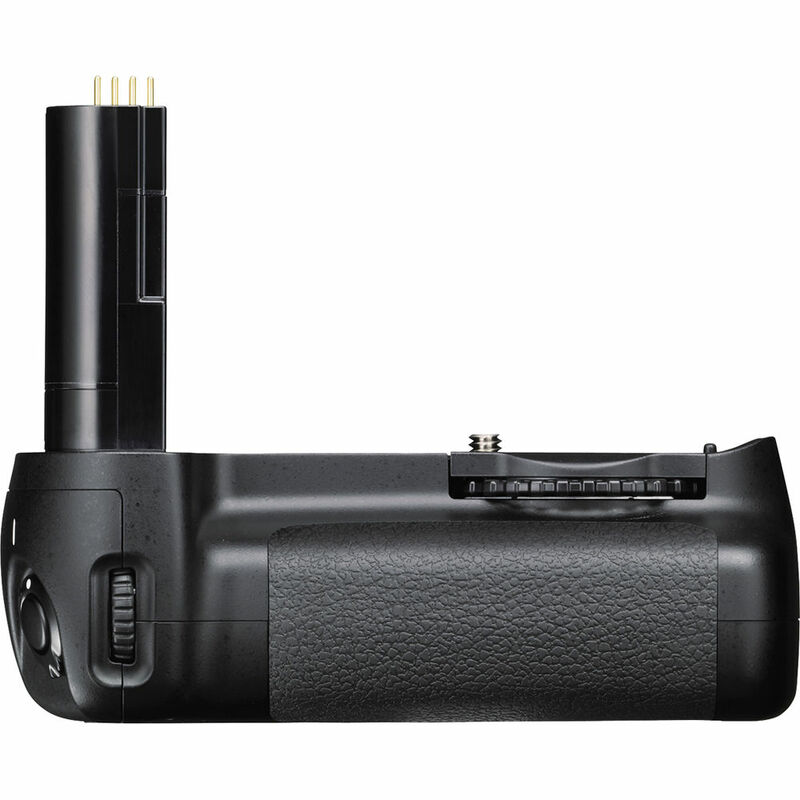 Use this Nikon MB-D80 Multi-Power Battery Pack for enhanced handling capabilities or to extend the battery life of your D80 or D90. This battery pack accepts one or two EN-EL3e lithium-ion batteries or six AA batteries if used with the included MS-D200 AA Battery Holder. The design of the grip improves vertical shooting. An additional shutter release button, AE/AF lock button, multi selector, and main- and sub-command dials are incorporated into its design for more intuitive handling. Box Dimensions (LxWxH) 5.984 x 4.803 x 3.071"
MB-D80 Multi-Power Battery Pack is rated 4.6 out of 5 by 422. Rated 5 out of 5 by Sherry from Great Addition There were several reasons I bought the MB-D80. One was longer battery life. I do a fare amount of night work and the long exposures tended to drain the 1 battery. I also wanted the extra shutter release for when the camera is turned on its side. Another plus I saw was the extra weight to help with the overall balance when using a long lens. For me all these pluses came true. The nice surprise was to find out it would work with only 1 battery if needed. The extra command dials also come in handy. The other surprise was the built in slot to hold the camera battery cover so it does not get lost. Nikon does a good job at thinking of the little things. Rated 5 out of 5 by Anonymous from Exceeds expectations Even though I've been shooting for 35 plus years, I've never had a camera with a vertical grip. This sure would have been handy when I was shooting kids sports photos. Now I'm not sure how I got along with out one. It was very easy to install and seems to be very ergonomic. One of my dissapointments about my D80 was that the battery that was included had no where the capacity that the owners manual suggested. Now with a second battery, I no longer worry about that issue. Since my gear is treated pretty gently, I can't really comment on it's durability but I have no reason to believe it wouldn't hold up very well under intended use. Rated 4 out of 5 by Anonymous from Heavy but worth it I use this with my D90 to increase battery life and to enable portrait shooting without bending my wrist. The portrait mode shutter button is excellent and locks off to prevent accidental shots when holding the camera in landscape mode. Pros: No more carpal tunnel syndrome! Easy on the wrist Monitor both batteries individually No need to change batteries in the middle of an event Comfortable textured grip Quality feel, professional look Command dial access while using in portrait position. Cons: Heavy, but to be expected with 2 batteries inside. Camera strap gets in the way when shooting portrait - I suggest adding a hook to hold it in place. Rated 5 out of 5 by Anonymous from A Must Have!!!! The battery pack provides you a good grip and great balance to hold your camera. The great benefit is that whether you are taking photos holding the camera horizontally or vertically, you have the same access to the shutter release button as well as the controls to the aperture and speed settings without bending your wrist. The nicest convenience is that it can either use the camera's battery unit or six-AA batteries. The only negative is that if you have a small camera bag, it may be too bulky to fit in the camera assembled with the battery pack. So if you are planning on shopping for a camera bag, don't buy the bag until you fit it with the battery pack. Rated 5 out of 5 by Anonymous from Never Leaves My Camera I f you a person who likes the feel of a large, sturdy camera package this add on is for you. In my opinion it makes the D80 package feel well balanced and actually minimizes hand held camera shake at lower shutter speeds. The ability to carry 2 el batteries extends shooting time to a full weekend of hard shooting for me. This would be over 600 pictures and some in camera viewing/editing as well as image downloading. The only minor negative is that the vertical shutter release is a little sensitive which takes some getting use to (1 good phot shoot) I also recommend locking the vertical release when not in use. Rated 5 out of 5 by AlanO from Pretty cool I wanted to get this so that I could shoot in portrait mode and still control my D90 as usual. The extra controls allow me to do that. It's nice to have 2 batteries, I don't have to worry as much about keeping the single one charged. I had to rearrange my bag to fit the extra bulk, but I got it to fit and still kept all of my lenses intact. Not to be a geek, but it just looks really cool. It gives the camera some extra personality and makes it look more pro. It takes some getting used to, whether in portrait or landscape mode. It changes the way you hold your camera. No big deal which is solved with time. Well made (of course) and fits great. Rated 4 out of 5 by Art Robinson from Why Did I Wait So Long? This is a great add on for my D90 and something I should of bought when I bought the camera. Thought about it but have waited. Being able to have two batteries means you can keep on shooting forever (almost) and the weight gives the camera a more solid feel and balance. It even has the AE button nicely located when using the shutter. I do agree with the reviewer though who said the shutter really has no halfway mark. There is, but don't have a feel to it like on the D90 itself, why I give it 4 stars and not 5. One thing for sure when I order my second D90 I will be buy another Grip for it, and it will be on the same order this time. How to take the battery cap off? To take the battery door off of the D80, you simply rotate the piece when it is at about a 40 degree angle. It should come right off. Yes the Nikon MB-D80 Multi-Power Battery Pack does have a tripod socket on the bottom to attach it to a tripod. Is this working for Nikon d90??? What happens to the battery cap on the original body when the grip is attached? Fortunately, there is a place in the grip to store it. You can see on photographs of the product that there is a slot on the side of the part that goes in the battery compartment. This slot is designed to hold the battery door.You can observe this location in Figure C on the third page of the product's manual. Yes, This is a genuine Nikon product.